The Marni spring 2016 collection reads like a 80’s pop study with all the pop colors and geometric shapes that reflect the era. 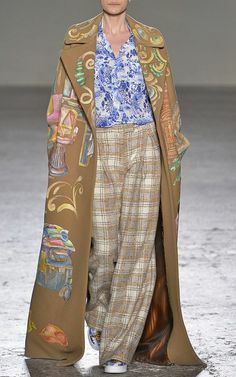 But looking beyond the well known Marni bangles and geometric earrings, there are some really good ideas and beautiful clothes. Get pass the heavy layered looks and there is a red apron dresses which hung over a white large-sequined skirt, or a green apron dress over brown trousers, or the leather wrap coat under another apron style dress. The flow of the fabrics guaranteed a measure of sophistication and wear-ability to the heavily layered looks. A more controlled hand successfully delivered black lace asymmetrical dresses which can be a hit with the Marni woman. This season seem to tote more a sense of minimalism that is always there among the Marni collection…behind the fur or layering. View the full show above.